City hall in the capital of Kyrgyzstan followed through on threats to chop down swathes of trees on June 2, sparking angry scenes of protest. Police were summoned to maintain public order and ended up detaining several demonstrators. At the start of May, Bishkek city hall announced plans to fell more than 1,000 trees to widen a thoroughfare as part of a project to ease traffic congestion. The idea sparked anger from residents and environmentalists, however, who say that authorities are making the city a more unpleasant place in which to live. Responding to the outcry, the mayor promised to delay works before city deputies could meet to discuss the issue. But then on June 2, workers from Zelenstroi, which is responsible for maintenance of parks and plants in the city, turned up and began sawing down trees unannounced. Mayor Albek Ibraimov said that the meeting of deputies was in fact held late on June 1, although no members of the public seem to have been informed of the event. According to an official order they showed to journalists on the scene, the plans have now been changed to chop down 143 trees instead of the previously planned 1,000. Indignant residents sought to stop operations by standing in front of trees and lying in the middle of the road to impede the progress of vehicles. Police in response dragged away some of the most vocal protesters. 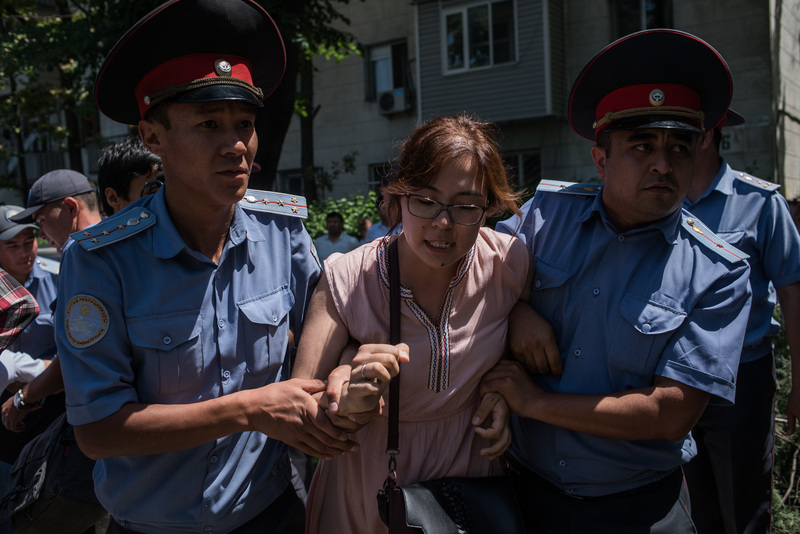 Among the detainees were Raushan Sarkeyeva, head of the City Initiatives foundation, Dmitry Betoshkin, head of Archa Initiative, and Tatyana Melek, a volunteer with the local city botanical gardens. The objections of environmentalists have been roundly rejected by the authorities. Deputy mayor Bakyt Dyushembiyev said that trees would continue to be chopped down, regardless of the protests. “The road has to be built. The building season is very short. And to stop this process now would be wrong,” he said.